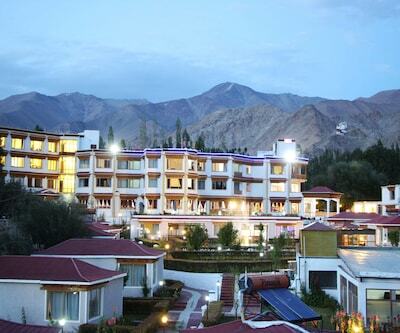 The Zen Ladakh is a 4-star hotel conveniently positioned at Sheldan Fort Road in Leh. It is located 3 km from Kushok Bakula Rimpochhe Airport, overlooking the picturesque mountain ranges and featuring well-appointed accommodations. This premium property is about 500 metres from Zorawar Singh Fort and 1 km from Tibetan Market. The hotel has an inviting swimming pool, a state-of-the-art fitness centre, beauty parlour, steam bath, and a salon. It is also equipped with a conference hall that can seat 120 people. Free Wi-Fi is available for the convenience of guests. Other facilities include a travel desk, doctor-on-call facility, shopping arcade, and parking space. Guests can choose from among 45 rooms at the property. The property features 4 types of rooms: Zen Premium Rooms, Presidential Suite, Executive Suite, and Family Suite. The air-conditioned rooms have all basic amenities like a TV, tea/coffee maker, minibar, electronic safe, and Wi-Fi. The hotel also provides in-room services like room service, laundry, and iron and iron board. 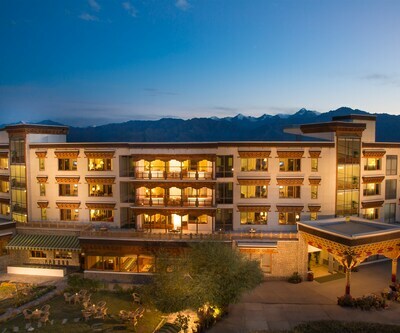 The Zen Ladakh has an in-house restaurant serving authentic Indian and multi-cuisine fares. The Kushok Bakula Rimpochee Airport is at a distance of 3.5 km from the property. The place is not connected by rail. The nearest railway station is at Jammu Tawi which is 700 km far. Zorawar Singh Fort is situated 500 metres from the property. Leh Gompa is 700 metres from the property, while Nezer Gyalpo is 850 metres away. Other landmarks include Tibetan Market (1 km), Moravian Church (1 km), and War Museum (4 km).